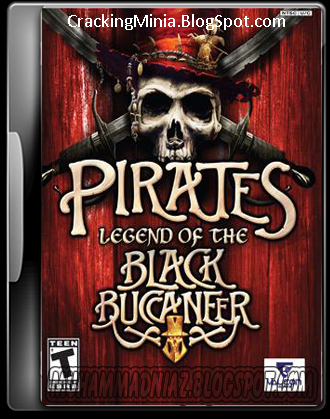 Pirates of the Caribbean: Legend of the Black Buccaneer is an adventure horror game set in the Caribbean in the sixteenth century.when The Da Vinci Code hit theaters, there was suddenly an abundance of books like Cracking Da Vinci's Code? Or how just as the 2005 Steven Spielberg/Tom Cruise summer blockbuster War of the Worlds was hitting theaters, we were also treated to the David Michael Latt/C. Thomas Howell direct-to-video shelf-filler H.G. Wells' War of the Worlds? Well, just in time to capitalize on the piratical fervor over Pirates of the Caribbean: Dead Man's Chest, budget publisher Valcon Games arrives with Pirates: Legend of the Black Buccaneer, rewarding those looking for another fun-filled summer romp with an action adventure game that teems with awkward platforming mechanics, one-note combat, confusing level designs, and simplistic puzzles. Legend of the Black Buccaneer is the Bolex watch of pirate games. Through some needlessly longwinded opening narration, you're told the tale of a slave-turned-demon-goddess who lures greedy sailors to her island lair with the promise of cursed treasure, which is how the game's protagonist, Francis Blade, finds himself shipwrecked at the start of the game, on an island populated by antagonistic monkeys, pirates, and other dastardly enemies. Almost immediately upon his arrival, Blade discovers a fancy amulet that magically turns this skinny European into some kind of hulking undead hoodoo spirit version of the old WWE wrestler Papa Shango. This creature is known as the Black Buccaneer, and with the ability to transform into this powerful, top hat wearing behemoth at will, Blade works his way across the island, fighting monkeys, plundering treasure, and collecting ship parts in order to get off this rotten island. Once the premise is set, the game doesn't spend much time elaborating any further. The action in Pirates: Legend of the Black Buccaneer is a mish-mash of other recent, memorable action adventure games like Tomb Raider and Prince of Persia, just not anywhere near as good as in any of them. There's lots of leaping around jungles, caverns, and ancient tombs. You'll encounter your fair share of puzzles that put the focus on box-pushing and switch-flipping. 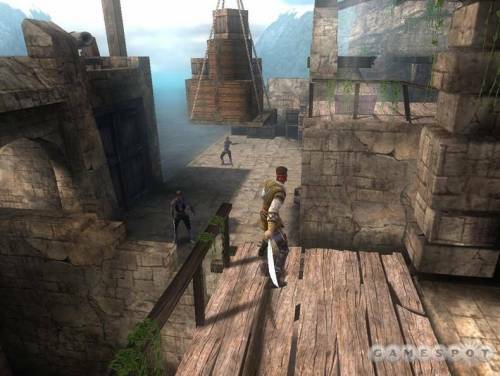 The levels are liberally peppered with enemies that you can take on with either your Francis Blade or Black Buccaneer personas, both of whom wield a pair of swords that can be put into deadly use by tapping at random on the square and triangle buttons. 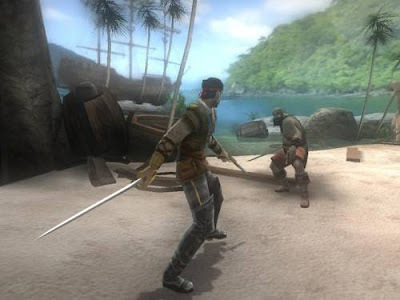 Playing as the Black Buccaneer gives you added strength and the ability to restore your own health by slaying enemies, but you can only play as him for a short while before reverting back to Francis Blade. If your enemies threaten to overwhelm you, you can summon a zombie at special zombie fountains to help turn the tide. In the hands of a competent developer, all this could've made for a decent knock-off, but WideScreen Games botches the job pretty thoroughly. The platforming elements are the most immediately frustrating, because they make up such a large portion of the action. Simply jumping looks and feels incredibly awkward, as if your character is weighed down with lead boots. However, when you're able to wrangle the camera in order to line up with another platform, your character suddenly springs to life, leaping much farther than he seems capable of. Damage taken from falling off platforms seems arbitrary. Fall down one floor and you'll keep on truckin' like nothing happened; fall down two floors and you'll be scraping your mangled corpse off the floor. When simply moving your character around feels like a chore, it doesn't bode well for the rest of the game. The puzzles, which tie in to the platforming elements, are less frustrating by virtue that they're all brick-simple exercises. Still, you'll regularly come upon a box you can't yet move or a switch you can't yet flip, requiring you to backtrack later on. It's quite rare, even in a really good game, for backtracking to be fun, and here it's a source of much frustration. The level designs are relatively small but extremely dense, usually consisting of multiple floors and exits to other areas, and it's quite easy to get turned around and lose sight of your next objective. The simplistic map is of little help either, since it gives you no sense of vertical space when most of the levels are often vertically oriented. The game's presentation does little to compensate for the tired, clunky gameplay in Pirates: Legend of the Black Buccaneer. The animations are consistently stiff and unnatural looking, and the character models are mostly just simple and bland, save for the Black Buccaneer, who just looks ridiculous. The environments, which are consistently small, are also coated with dreary, washed-out textures that trade mostly in muddled earth tones. There are the occasional soft-glow effects and a black halo wraps the screen when you play as the Black Buccaneer, but even when the game isn't trying to show off with fancy effects, the frame rate is inexplicably erratic. The sound design actually seems unfinished, with a lot of repetitive or apparently absent sound effects. From stem to stern, Pirates: Legend of the Black Buccaneer is derivative and uninspired. It cribs shamelessly from some of the best action adventure games of the past few years, and in the process fumbles the execution of the elements that made games like Tomb Raider and Prince of Persia so memorable. This game is banking almost entirely on its flimsy word association with Pirates of the Caribbean, and has nothing of worth to offer beyond that. Even the most steadfast enthusiasts of piracy should avoid getting Shanghaied by this one.